Dumbbells offer excellent variety for your weight training efforts. If you can't afford an ongoing gym membership, investing in dumbbells you can use at home is a good alternative. You can achieve an excellent workout using your dumbbells and this weight training program at home. There are two great options for dumbbell equipment, depending on your budget and goals. You don't need much equipment to commence a full dumbbell program at home. 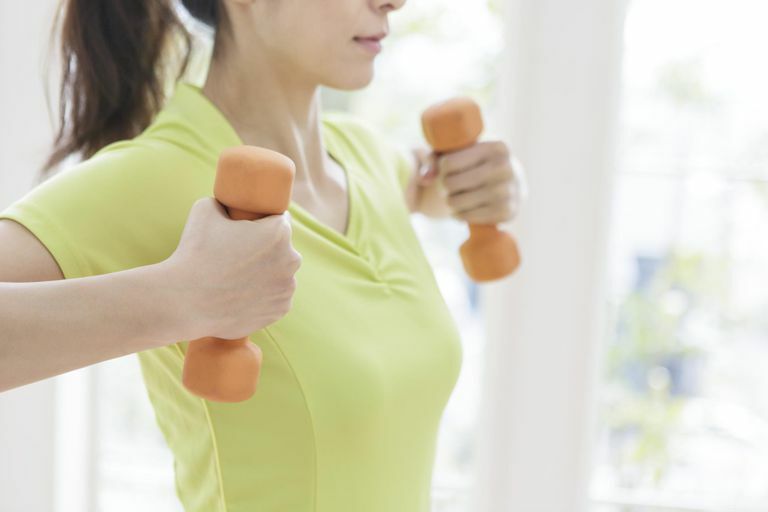 At a minimum, all you need are two sets of dumbbells: one heavier set and one lighter set. Use the heavier set for exercises in which you can manage more weight, such as squats and lunges for example. Use the lighter set for exercises such as raises, rows, curls, and similar joint-taxing exercises. For example, you might do shoulder squats with 20 pounds (9 kg) and lateral raises with 12 pounds (5.5 kg). Try to figure out what weights you need to start with if you use this minimalist approach. Test with a friend's weights, pay for a gym session to become acquainted with the weights or ask a personal trainer to help you. You can do the complete program below with your two sets of dumbbells, even if a little compromise is required with weight selection. The main problem with this approach is that as you get stronger and fitter, you will probably need to move up to heavier dumbbells, but do not buy heavier weights in anticipation of growing into them. This is a sure way of causing injury to yourself and missing your goals! If you can afford to spend more, you can buy a full rack of dumbbells or a set of adjustable dumbbells. Dumbbell prices vary considerably depending on the manufacturer and the design. You may prefer a small rack, however, such as adjustable dumbbells like Bowflex, Stamina, and Bayou. These have the advantage of saving space in small rooms, basements, and garages. You don't have to use a bench with an adjustable backrest, but they are useful. You can do all sorts of seated dumbbell exercises like presses, rows, raises, curls and extensions, plus dips and crunches. That's pretty much it: Dumbbells and a bench. Here's a recommended at-home program. All exercises are 3 sets of 12 repetitions. Read up on weight training fundamentals if you need more information before starting this program.